Your dream is coming true my angel child. 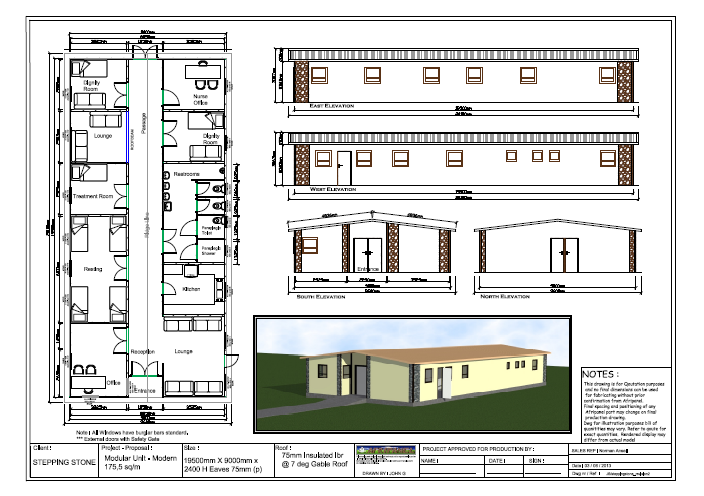 Your Stepping Stone Hospice is functioning, and we have received a building as a donation! Next week construction will start and by the end of the month we will move in! Behind the building there is a duck pond and a quaint little chapel. I look forward to planting some roses in the garden! We anticipate wheeling our day-care patients into the garden so they can feed the ducks. We have had wonderful offers of help. A woman phoned today and said that she did not know how to care for a sick person, but she was prepared to go clean a sick person’s home… We have had offers of help from professional councillors, people from all wards of life…Now we can only hope and pray that people will volunteer furniture and make some financial contributions! I am amazed at the goodness and generosity of people. The company that donated the building belongs to a young man, Jaco Schultz. You would have liked him my angel. He is really a nice young man with a “white heart”. I did not find him. He found us! Long story…here is the short version! The meeting itself was quite funny. It was when I had that terrible flu. The morning of the meeting I hardly had a voice, my head was throbbing and I was certain I would die. 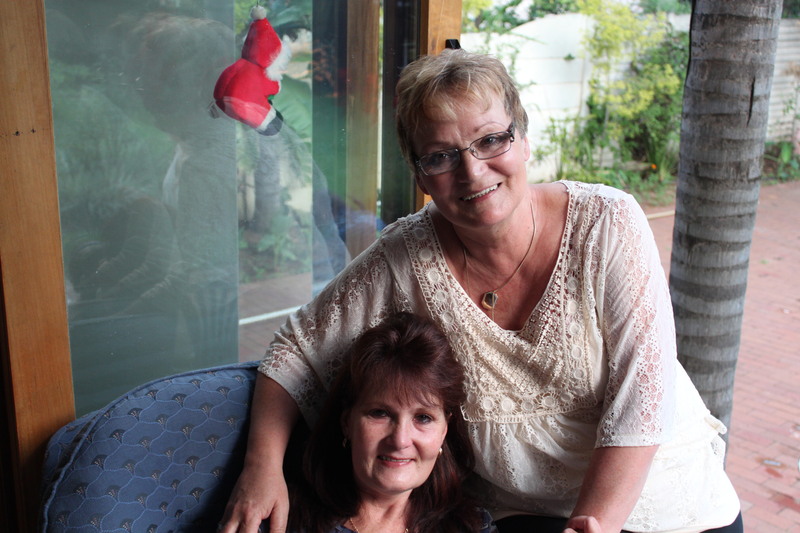 Remember the woman you met, who lives around the corner from us and whose daughter-in-law was paralysed in an accident in December 2012? She was at the meeting. I was so scared I would spread my flu germs, and she would contract my flu, that I wore a facemask – I did not want DiL’s death on my conscience. It must have looked so funny! Me with this horrible surgical facemask… gasping for oxygen and only breathing in concentrated germs! Jaco asked to see the terrain, and we went on a walk-about. He asked whether a tree could be moved….We had a promise of a building that would have a small day-care centre, two dignity rooms, a treatment room…! As easy as that! Within weeks the promise is becoming a reality. Construction starts next week! I am so excited! So my Angel Girl, there was a purpose to your suffering after all. I wish it was different but it isn’t. We have been blessed beyond comprehension. I believe that God is personally overseeing this project. Love and miss you with all my heart Sweetie. 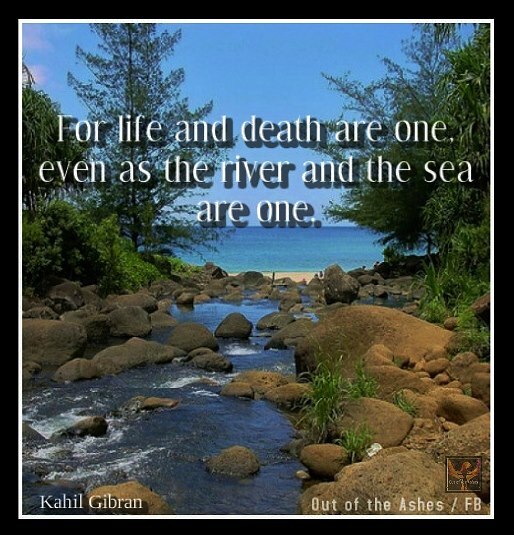 Palliative care usually starts too late. We see it on a daily basis at Stepping Stone Hospice… Most patients die within days of becoming patients. Doctors continue to treat the patients until days before their death. Referring a patient to Hospice means “conceding defeat”. If patients were timorously referred to Hospice they would enjoy far greater quality of life than they do without. It is a total fallacy that Hospice patients die sooner than non-hospice patients. For the entire sample of all disease cohorts, the mean number of survival days was eight days longer for hospice patients than for non hospice patients (337 vs. 329 days, P ¼ 0.00079). World Health Organization (WHO) definition of Palliative Care Palliative Care is an approach that improves the quality of life of patients and their families facing problems associated with life-threatening illness, through the prevention and relief of suffering, the early identification and impeccable assessment and treatment of pain and other problems, physical, psychosocial and spiritual. The good news is that living with advanced illness does not mean that one has to live with uncontrolled pain. The majority of time, pain can be controlled by relatively simple means using easy to administer medications. But caregivers often worry that they do not have the knowledge and skills, or the confidence to administer the proper medications or treatments prescribed for their loved ones. Misconceptions about pain and commonly used medications may create barriers to controlling pain effectively. Understanding what pain is, how it can be effectively managed, and alleviating common misconceptions is the first step towards reducing these barriers. Reality: In 1984, pain research expert, Margo McCafferty defined pain as “whatever the experiencing person says it is, existing whenever he says it does.” We cannot tell if a person is having pain by looking at them. Only the person having pain knows how it feels so it is important that we ask the person if they are having pain and how it feels and we need to listen to their answer. Reality: It is best to stay ahead of the pain by taking medications around the clock when treating persistent pain. The longer pain goes untreated, the harder it is to ease. If the prescription says to take the medicine at certain times or at certain time intervals (for example, every four hours), make sure this is done. Reality: Opioid analgesics (also referred to as narcotics) are highly effective for many types of pain and can be given safely. Addiction is defined by a compulsive craving and use of a drug, which results in physical, psychological, and social harm to the user. Addiction is NOT a problem for people who take opioid medications for persistent uncontrolled pain. Reality: Most patients take stable dosages of medication. Increases in medication dosage may result from worsening physical status. Sometimes tolerance develops and more medication is needed. It is important to understand that there is no highest dose for the amount of opioid medication that can be prescribed – there will always be something more that can be given to achieve comfort. Reality: The goal of pain management is to achieve comfort while maintaining optimal alertness. Side effects of drowsiness will reduce or disappear within a few days. The most common side effect is constipation which can be controlled with a regular routine of medications aimed at keeping bowels regular. Reality: Morphine does not initiate the final phase of life or lead directly to death. Morphine provides relief of severe, chronic pain, promotes relaxation and comfort, and can also help to make breathing easier. Morphine does not lead to death. Morphine does not kill. Good pain management improves quality of life and may even extend life. Palliative care and hospice professionals can provide you and your loved one with expert help that can help to manage the physical and emotional pain of life limiting illness. Caring for a loved one in pain can be difficult but with the right guidance and understanding, both you and your loved one can experience the comfort and support you deserve. 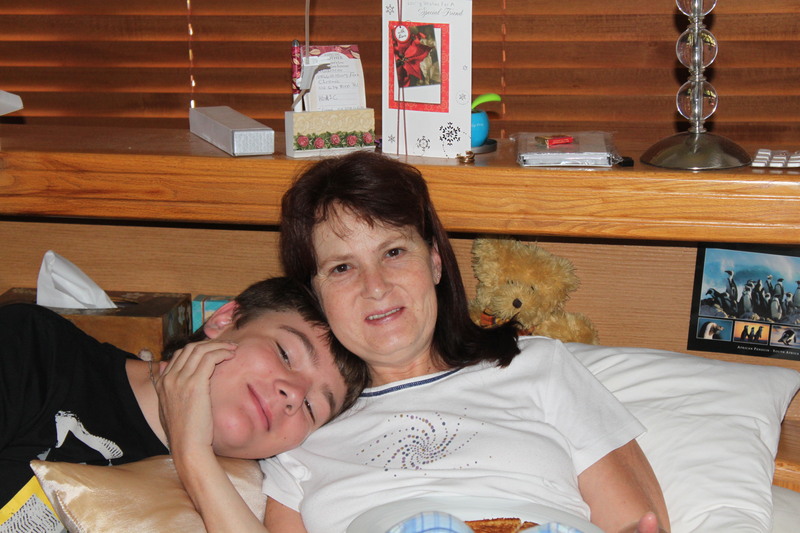 I know that Hospice provided my child with life. 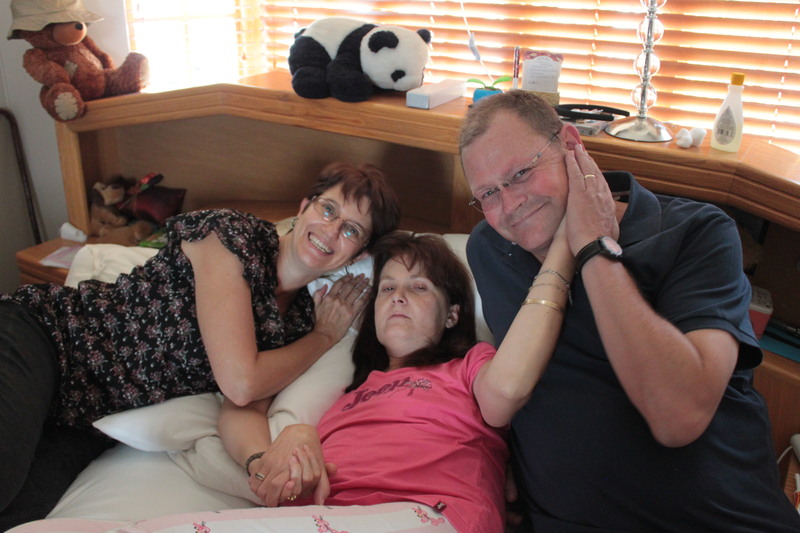 I believe that Vic would have died months earlier if she had not been treated by Hospice. It is a basic human right to die with dignity. I am grateful that Vic had the privilege of dying with dignity. I am cautiously optimistic that we have managed to stop the bleeding ulcer and that the new medicine regime has the vomiting under control. Vic is still running a fever, her BP is dropping and her heart rate has stabilized in the 110’s. She appears to be more stable than she has been in a couple of weeks. “Tippex (correction liquid) for the boys and Stilpain and Syndol (Tablets)” she said. This incredible young woman just does not know how to die! Vic had a good breakfast this morning. Vic has not eaten since Christmas! The boys are fleeing home. Jon-Daniel has spent the past day and a half at Esther and Leon’s. Jared went to his Dad’s. I wish I too could flee. For the first time in my life I have come to understand why families place their dying loved ones in hospital of in a Hospice In-Patient unit. The waiting is gruelling and heart wrenching. The rollercoaster of dying is horrific! I previously researched the “length of dying”. As one begins to accept their mortality and realizes that death is approaching, they may begin to withdraw from their surroundings. They are beginning the process of separating from the world and those in it. They may decline visits from friends, neighbors, and even family members. When they do accept visitors, they may be difficult to interact with and care for. They are beginning to contemplate their life and revisit old memories. They may be evaluating how they lived their life and sorting through any regrets. They may also undertake the five tasks of dying. The dying person may experience reduced appetite and weight loss as the body begins to slow down. The body doesn’t need the energy from food that it once did. The dying person may be sleeping more now and not engaging in activities they once enjoyed. They no longer need the nourishment from food they once did. The body does a wonderful thing during this time as altered body chemistry produces a mild sense of euphoria. They are neither hungry nor thirsty and are not suffering in any way by not eating. It is an expected part of the journey they have begun. This is the time during the journey that one begins to sleep most of the time. Disorientation is common and altered senses of perception can be expected. One may experience delusions, such as fearing hidden enemies or feeling invincible. The dying person may also experience hallucinations, sometimes seeing or speaking to people that aren’t there. Often times these are people that have already died. Some may see this as the veil being lifted between this life and the next. The person may pick at their sheets and clothing in a state of agitation. Movements and actions may seem aimless and make no sense to others. They are moving further away from life on this earth. The body temperature lowers by a degree or more. The pulse becomes irregular and may slow down or speed up. Skin color changes as circulation becomes diminished. This is often more noticeable in the lips and nail beds as they become pale and bluish. Breathing changes occur, often becoming more rapid and labored. Congestion may also occur causing a rattling sound and cough. Speaking decreases and eventually stops altogether. The person is moving closer towards death. There may be a surge of energy as they get nearer. They may want to get out of bed and talk to loved ones, or ask for food after days of no appetite. This surge of energy may be quite a bit less noticeable but is usually used as a dying person’s final physical expression before moving on. The surge of energy is usually short, and the previous signs become more pronounced as death approaches. Breathing becomes more irregular and often slower. “Cheyne-Stokes”breathing, rapid breathes followed by periods of no breathing at all, may occur. Congestion in the airway can increase causing loud, rattled breathing. Hands and feet may become blotchy and purplish (mottled). This mottling may slowly work its way up the arms and legs. Lips and nail beds are bluish or purple. The person usually becomes unresponsive and may have their eyes open or semi-open but not seeing their surroundings. It is widely believed that hearing is the last sense to go so it is recommended that loved ones sit with and talk to the dying during this time. Vic has experienced severe delirium or rather terminal restlessness, which is apparently a fairly common symptom in many dying patients. restlessness, anxiety, agitation, and cognitive failure. Vic is on massive dosages of medication. She is peaceful now. On Monday, the 14th, Jon-Daniel will receive his school colours for academic achievements. Vicky is determined to attend the ceremony. We will find a way of getting her to the school to witness this achievement. I believe it is the last goal she has. Vic is rapidly deteriorating. Last night the nausea was absolutely relentless. With no food in her stomach Vic vomited blood. Old blood and new blood….. Her vitals are very unstable and I thought that she would not survive the night. I cried and slept in her bed with her. Today Sr Siza tried to put up an IV drip. Vic has absolutely no veins left that are suitable for a drip. The sub-cutaneous driver is back up. At this stage of the game the risk of cellulitis is less than the need for pain and symptom control. We will reposition the subcutaneous driver as and when we need to. She suggested that Vic be admitted to hospital. Vic refused. 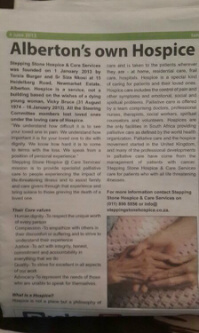 On the 1st of January 2013 Stepping Stone Hospice and Palliative Care started operating. It is pretty ironic that Vic may well be our first death. 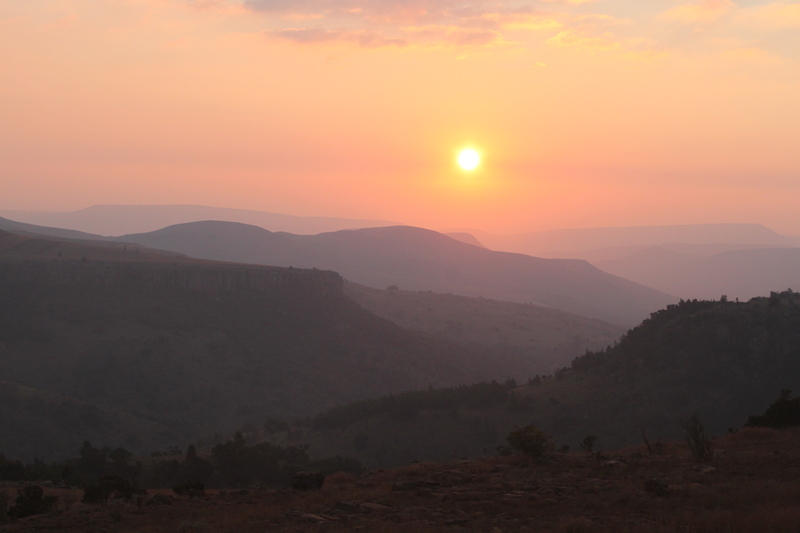 But then again, tomorrow may be better than yesterday….Today was better than last night. Early this morning I posted “My child is in a pain-free sleep. I will now try to sleep. “Tomorrow may be a rough day” https://tersiaburger.com/2012/12/07/tomorrow-may-be-a-rough-day/ not realising that the night was not over yet. My poor child had a horrible night. The pain was under control, but her arm still throbbed, and she was restless. I was busy with some Christmas gifts. I tried to go to sleep, but gave it up as a bad job. So I wrote a post. At 2am this morning I had just “published” when Vic rang the intercom. I ran down the passage knowing that my poor child had vomited again. The poor little thing was standing in the shower covered in her 7 pm dinner and antibiotic tablets. The food had not digested at all. She was shivering and crying. I cleaned up whilst Vic showered. “I am sorry Mommy. I am so sorry Mommy”… Vic sobbed. I eventually got into bed at 5am. Three hours sleep used to be enough sleep when I was younger. I think I am getting old. I need more than 3 hours. Maybe it is time to look at a night nurse…..
Monday morning Dr Sue will come to the house and do the procedure here. Yesterday I spoke with a wonderful young man, Marchelle. I was privileged to have worked with Marchelle worked for a couple of years. Unfortunately we lost a large contract and had to go our separate ways. Marchelle has a pure heart. He is selfless and one of the very few people I trust with every fibre of my being. Marchelle has never let me down. Marchelle told me he is following my blog. He asked me whether I thought the situation is truly as bad as Hospice say it is. I said I did. I walked into Vic’s room and stood in the door looking at my beautiful little girl sleeping. I am so tired that I am allowing the negativity of the situation to get to me. It was however only at 4:00 am that the reality of Vic’s situation re-settled around my heart like a lead jacket – I know my child has had enough. Marchelle said he prays for us every day, and I believe him. She was absolutely delighted with their marks. The boys had worked hard and deserve every mark they received. I wonder whether the boys will remember in the years to come that their Mommy got out of her sick- bed to go with them to collect their 2012 report cards. We are so proud of them. They are brave kids. On Sunday we will celebrate my birthday. On the 24th we will have our first Christmas dinner with Lani, Tom and all their kids. Simone still believes in Santa! On the 25th we will go to Church. On the 26th we will celebrate Jared’s birthday. On the 27th we will start planning our New Year celebrations. Vic and her baby Jon-Daniel..